[S839] Descendants of Amos Walton, Amos Walton Family Bible (Edinburgh, Scotland: Mark and Charles Kerr, His Majesty's Printers, 1793); present owner: Deborah Brown, Owasso OK (June 2009). [S842] Charles Thomas Ball, "Ball Family Tree on "Find a Grave"," database made available on-line courtesy of Charles Thomas Ball, http://www.findagrave.com/cgi-bin/fg.cgi?page=gr&GSvcid=60336&GRid=27675107&, database put on-line 8 June 2009. [S7] 1850 (June 1) U.S. Census, Worth, Mercer Co., PA, p. 863 (stamped 432). He was a local minister of the Methodist denomination, and was a justice of the peace of Pymatuning, Hempfield, Otter Creek and Delaware townships for more than thirty years, having been appointed by the different governors of the state of Pennsylvania.3 Photo courtesy of Charles Ball of Richmond IN; previously found on-line by others, but the original source is unknown and apparently no longer on-line. 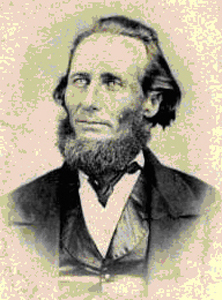 Some trees show this photo as that of his father (1793-1861), but this type of portrait is much more likely to have been done in the 1880s. [S836] J. G White, compiler, A twentieth century history of Mercer County, Pennsylvania; a narrative account of its historical progress, its people, and its principal interests, prepared under the general editorial supervision (Chicago, Illinois: Lewis Publishing Company, 1909). [S7] 1850 (June 1) U.S. Census, Delaware, Mercer Co., PA, p. 305 (stamped 153). [S8] 1860 (June 1) U.S. Census, Delaware, Mercer Co., PA, p. 165 (stamped 69). [S7] 1850 (June 1) U.S. Census, Worth, Mercer Co., PA, p. 865 (stamped 433). [S8] 1860 (June 1) U.S. Census, Sandy Lake, Mercer Co., PA, p. 175 (stamped 639). [S7] 1850 (June 1) U.S. Census, Jackson, Parke Co., IN, p. 1114 (back of stamped 557). [S8] 1860 (June 1) U.S. Census, Posey, Rush Co., IN, p. 21. [S7] 1850 (June 1) U.S. Census, Worth, Mercer Co., PA, p. 861 (stamped 431). [S8] 1860 (June 1) U.S. Census, Posey, Rush Co., IN, p. 23. [S9] 1870 (June 1) U.S. Census, Posey, Rush Co., IN, p. 14 (back of stamped 361). [S903] Find A Grave - A User-Contributed Listing of Cemeteries and Memorials; Find A Grave Founder Jim Tipton, 2009; online at http://www.findagrave.com/cgi-bin/fg.cgi?page=gs&, Ball Graveyard, Rush Co., IN. [S8] 1860 (June 1) U.S. Census, Posey, Rush Co., IN, p. 39. [S9] 1870 (June 1) U.S. Census, Posey, Rush Co., IN, p. 7 (stamped 358). [S10] 1880 (June 1) U.S. Census, Posey, Rush Co., IN, ED 82, p. 35 (stamped 81). [S7] 1850 (June 1) U.S. Census, Coolspring, Mercer Co., PA, p. 683 (stamped 342). [S8] 1860 (June 1) U.S. Census, Charlottesville, Hancock Co., IN, p. 148. [S8] 1860 (June 1) U.S. Census, Worth, Mercer Co., PA, p. 205 (stamped 935). [S9] 1870 (June 1) U.S. Census, Worth, Mercer Co., PA, p. 12 (back of stamped 219). Elizabeth Harper was born on 9 August 1799 at Cool Spring, Mercer Co., PA.1 She was the daughter of Daniel Harper and Elizabeth Miller.1 Elizabeth Harper married Amos Walton Ball, son of Caleb Ball and Phebe Walton, on 14 July 1817 at Cool Spring, Mercer Co., PA.1 Elizabeth Harper died on 1 April 1881 at Clarksville, Mercer Co., PA, at age 81.1 She was buried at Ball Cemetery, Delaware, Mercer Co., PA.
[S9] 1870 (June 1) U.S. Census, Clarks Mills, Mercer Co., PA, p. 4 (back of stamped 34). [S10] 1880 (June 1) U.S. Census, Clarksville, Mercer Co., PA, p. 51 (stamped 370). [S903] Find A Grave - A User-Contributed Listing of Cemeteries and Memorials; Find A Grave Founder Jim Tipton, 2009; online at http://www.findagrave.com/cgi-bin/fg.cgi?page=gs&, Oak Hill Cemetery, Sandy Lake, Mercer Co., PA.
[S7] 1850 (June 1) U.S. Census, Salem, Mercer Co., PA, p. 694 (back of stamped 347). [S2678] Charles Ball, "Ball #2," database made available on-line courtesy of Charles Ball, http://trees.ancestry.ca/tree/42240983/person/28667221622?ssrc=, database viewed 4 September 2015. [S8] 1860 (June 1) U.S. Census, Otter Creek, Mercer Co., PA, p. 209 (stamped 479). [S9] 1870 (June 1) U.S. Census, Sandy Lake, Mercer Co., PA, p. 7 (stamped 65). [S10] 1880 (June 1) U.S. Census, Sandy Lake, Mercer Co., PA, p. 17 (back of stamped 397). Photo courtesy of Charles Ball of Richmond IN. [S7] 1850 (June 1) U.S. Census, Sandy Creek, Mercer Co., PA, p. 608 (back of stamped 304). [S8] 1860 (June 1) U.S. Census, District 2, Hardin Co., KY, p. 83. [S903] Find A Grave - A User-Contributed Listing of Cemeteries and Memorials; Find A Grave Founder Jim Tipton, 2009; online at http://www.findagrave.com/cgi-bin/fg.cgi?page=gs&, Glenwood Cemetery, Clark, Mercer Co.. PA.
[S7] 1850 (June 1) U.S. Census, Pymatuning, Mercer Co., PA, p. 257 (stamped 126). [S8] 1860 (June 1) U.S. Census, Clarksville, Mercer Co., PA, p. 38 (back of stamped 5). [S9] 1870 (June 1) U.S. Census, Clarks Mills, Mercer Co., PA, p. 5 (stamped 35). [S10] 1880 (June 1) U.S. Census, Clarksville, Mercer Co., PA, p. 50 (back of stamped 369). [S12] 1900 (June 1) U.S. Census, Delaware, Mercer Co., PA, ED 132, Sheet 7B (back of stamped 99). [S13] 1910 (April 15) U.S. Census, Jefferson, Mercer Co., PA, ED 161, Sheet 3B (back of stamped 285). Amos Walton Ball was born on 10 July 1824 at Cool Spring, Mercer Co., PA.1 He was the son of Amos Walton Ball and Elizabeth Harper.1 Amos Walton Ball married Eliza Jane Early, daughter of Robert Early and Elizabeth Mattocks, circa 1856.1 Amos Walton Ball died on 18 February 1890 at Mercer Co., PA, at age 65.1 He was buried at Ball Cemetery, Delaware, Mercer Co., PA.
[S8] 1860 (June 1) U.S. Census, Jasper, Jasper Co., IL, p. 83. [S9] 1870 (June 1) U.S. Census, Delaware, Mercer Co., PA, p. 7 (stamped 23). [S10] 1880 (June 1) U.S. Census, Delaware, Mercer Co., PA, ED 205, p. 6 (back of stamped 14). Sarah Ball was born on 22 September 1826 at Mercer Co., PA.1 She was the daughter of Amos Walton Ball and Elizabeth Harper.1 Sarah Ball died on 24 August 1831 at Mercer Co., PA, at age 4.1 She was buried at Ball Cemetery, Delaware, Mercer Co., PA.
[S8] 1860 (June 1) U.S. Census, Delaware, Mercer Co., PA, p. 164 (stamped 68).